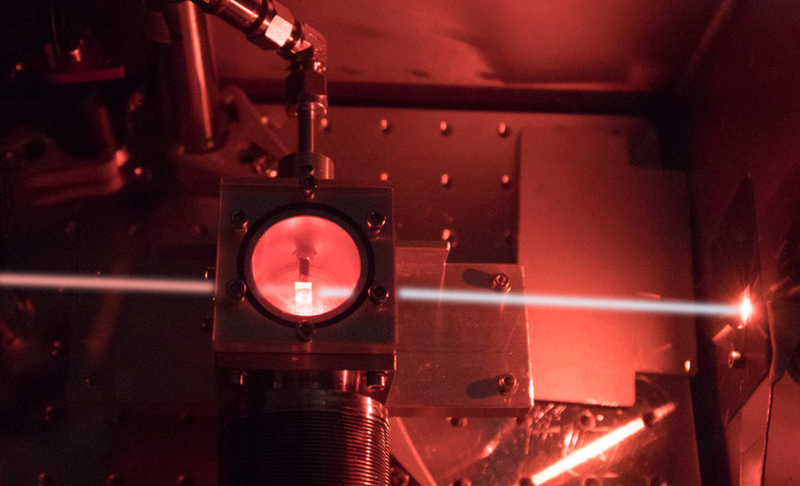 Researchers at CFEL at DESY in Hamburg have generated a 1.9-femtosecond ultraviolet laser light pulse - setting a record for ultraviolet (UV) laser pulses with the shortest duration. The experiments, published in the recent issue of Optics Letters, outshine the previous record of 2.8 femtoseconds, set in 2010. The 1.9-femtosecond UV flash is made via up-conversion of infrared light in a gas cell (in the glass cube in the center of the vacuum chamber, photo: DESY/ Calegari group). The 1.9-femtosecond pulse (1 femtosecond is a millionth of a billionth of a second) has been generated in the laboratory of Prof. Francesca Calegari, leading scientist at DESY and head of the attosecond science group at the Center for Free-Electron Laser Science (CFEL), a cooperation of DESY, Hamburg University and Max Planck Society. It covers the very relevant spectral region between 210 and 340 nanometers (nm), corresponding to the so-called UVB and UVC energy ranges. UVB radiation contained in the solar emission partially penetrates our atmosphere, thus triggering a number of bio-chemically relevant processes including damage of the DNA, leading to skin cancer. These processes are often based on ultrafast mechanisms that require extremely short light pulses to be captured in real time. Generating ultrashort UV pulses has always been a challenge due to the high dispersion of light in this spectral region in air and in materials that are used for their generation. The approach used by the team of Prof. Calegari is frequency up-conversion of 5-femtosecond infrared pulses in a high-pressure laser-fabricated gas cell located in vacuum. This method allows for the shortest pulse duration to be preserved. The research conducted in the team of Prof. Calegari, in collaboration with the Institute of Photonics and Nanotechnology (IFN-CNR, Milano, Italy) and Politecnico di Milano (Milano, Italy), has been financed by the European Starting Grant STARLIGHT (STeering Attosecond electRon dynamics in biomolecules by UV/XUV LIGHT pulses) and it opens new important perspectives for ultrafast molecular spectroscopy, as a promising tool to reach a deeper understanding of the first instants of UV induced photochemical reactions and bio-damage effects.